The Attacking analysis has been used to produce 16 sessions (75 practices) including functional practices, patterns of play, possession games, transition games, opposed/unopposed zone play, game situations and small sided games. 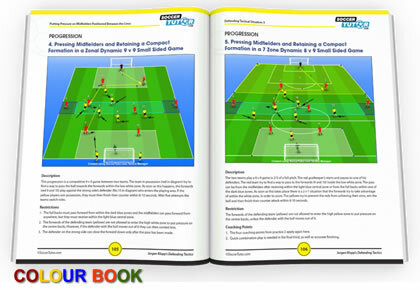 The Defending analysis has been used to produce 14 sessions (53 practices) including functional practices, opposed/unopposed zone play, transition games, game situations and small sided games. 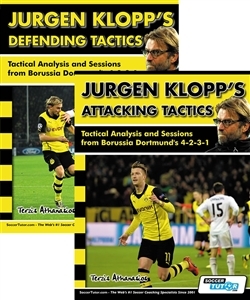 This long awaited 2 book set in FULL COLOUR contains a full and extensive analysis of Jurgen Klopp's Borussia Dortmund team. This tactical blueprint is explained clearly with supporting diagrams, notes and detailed descriptions. Not the first ebook I have bought and it won't be the last. Excellent detailed sessions. Written professionally. Great book!Explains the way of thinking of Jurgen Klopp,how his team is attacking the oponnent in many different variations!